Evidence of forced labour on a huge World Cup infrastructure project. Some Nepalese men have alleged that they have not been paid for months and have had their salaries retained to stop them running away. Some workers on other sites say employers routinely confiscate passports and refuse to issue ID cards, in effect reducing them to the status of illegal aliens. Some labourers say they have been denied access to free drinking water in the desert heat. About 30 Nepalese sought refuge at their embassy in Doha to escape the brutal conditions of their employment. “The evidence uncovered by the Guardian is clear proof of the use of systematic forced labour in Qatar,” said Aidan McQuade, director of Anti-Slavery International, which was founded in 1839. Qatar has the highest ratio of migrant workers to domestic population in the world: more than 90 per cent of the workforce are immigrants and the country is expected to recruit up to 1.5 million more labourers to build the stadiums, roads, ports and hotels needed for the tournament. Nepalese account for about 40 per cent of migrant labourers in Qatar. More than 100,000 Nepalese left for the emirate last year.The murky system of recruitment brokers in Asia and labour contractors in Qatar leaves them vulnerable to exploitation. The supreme committee has insisted that decent labour standards will be set for all World Cup contracts, but underneath it a complex web of project managers, construction firms and labour suppliers, employment contractors and recruitment agents operate. theguardian.com, Thursday 26 September 2013– QATAR’s construction frenzy ahead of the 2022 World Cup is on course to cost the lives of at least 4,000 migrant workers before a ball is kicked, the International Trade Union Confederation (ITUC) has claimed. The group has been scrutinising builders’ deaths in the Gulf emirate for the past two years and said that at least half a million extra workers from countries including Nepal, India and Sri Lanka are expected to flood in to complete stadiums, hotels and infrastructure in time for the World Cup kickoff. The annual death toll among those working on building sites could rise to 600 a year – almost a dozen a week – unless the Doha government makes urgent reforms, it says. The ITUC has based the estimate on current mortality figures for Nepalese and Indian workers who form the bulk of Qatar’s 1.2 million-strong migrant workforce, the large majority of whom are builders. While it admits that the cause of death is not clear for many of the deceased – with autopsies often not being conducted and routine attribution to heart failure – it believes harsh and dangerous conditions at work and cramped and squalid living quarters are to blame. 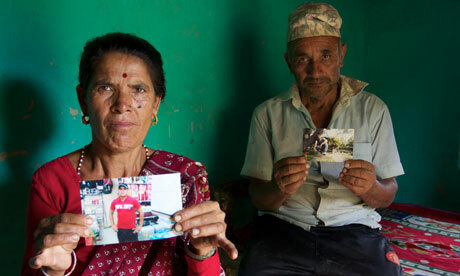 The stark warning came after a Guardian investigation revealed that 44 Nepalese workers died from 4 June-8 August this year, about half from heart failure or workplace accidents. Workers described forced labour in 50C heat, employers who retain salaries for several months and passports making it impossible for them to leave and being denied free drinking water. The investigation found sickness is endemic among workers living in overcrowded and insanitary conditions and hunger has been reported. Thirty Nepalese construction workers took refuge in the their country’s embassy and subsequently left the country, after they claimed they received no pay. The Indian ambassador in Qatar said 82 Indian workers died in the first five months of this year and 1,460 complained to the embassy about labour conditions and consular problems. More than 700 Indian workers died in Qatar between 2010 and 2012. Without changes to working practices, more workers will die building the infrastructure in the runup to the World Cup than players will take to the field, the ITUC has warned. “Nothing of any substance is being done by the Qatar authorities on this issue,” said Sharan Burrow, the general secretary of the Brussels-based organisation that has met the Qatari labour minister in Geneva and officials at the Qatar 2022 supreme committee, which is preparing the country for the World Cup. “The evidence-based assessment of the mortality rate of migrant workers in Qatar shows that at least one worker on average per day is dying. In the absence of real measures to tackle that and an increase in 50% of the migrant workforce, there will be a concominant increase in deaths. It is estimated that Qatar, the world’s richest country by income per capita, is spending the equivalent of £62bn from its gas and oil wealth on building transport infrastructure, hotels, stadiums and other facilities ahead of the World Cup. The ITUC has estimated the number of migrant workers already in Qatar at over 1.2 million and says possibly as many as 1 million more will be needed to get the country ready for the world’s biggest sporting event. “Fifa needs to send a very strong and clear message to Qatar that it will not allow the World Cup to be delivered on the back of a system of modern slavery that is the reality for hundreds of thousands of migrant workers there today,” said Burrow. The ITUC’s own analysis of deaths this summer appears to tally with the Guardian’s investigation. 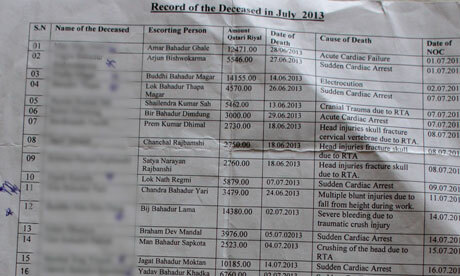 It found that 32 Nepalese workers died in July, many of them young men in their 20s. “Nepal accounts for less than half the migrant workers in Qatar, and reports from other countries-of-origin indicate that similar numbers of workers from these countries are losing their lives in Qatar,” Burrow said. Asked to comment on the prediction of thousands of deaths, a spokesman for the Qatar 2022 supreme committee said on Thursday that organisers were “appalled” by the the Guardian’s revelations about the deaths of Nepalese workers who travelled to the Gulf state to work. “Like everyone viewing the video and images, and reading the accompanying texts, we are appalled by the findings presented in the Guardian’s report,” the spokesman said. “There is no excuse for any worker in Qatar, or anywhere else, to be treated in this manner. A leading expert in labour migration to the Gulf from south Asia warned Qatar that ill-treatment of workers would backfire because the labour forces they rely on to build their economies will start resisting. Prof S Irudaya Rajan, chairman of the research unit on international migration at the centre for development studies in Kerala, India, said: “They need people from India and Nepal to give their hard work and they need better treatment because they are the ones building their whole economy. Rajan said he believed Indian workers were better treated than some others because the relatively long history of the country sending workers to the Gulf means support networks are already in place for them. • This article was amended on 26 September 2013. The name of the International Trade Union Confederation was given wrongly as the International Trade Union Congress. This has been corrected.